The title of this article is ambiguous. Indiana Jones (Disambiguation). 6.95 points at 21 votes (rank 359). The game mainly follows the movie original. Unfortunately, there was only this action adventure version with puzzle elements for the C64 and not the "point and click" adventure version. This game is a partially very difficult jump and run which contains several levels and in which you need to help Indy in the search for different works of art. Each level has different tasks but there is always an important art item that needs to be found and picked up. In the first level you need to find the Cross of Coronado in the caves, find the way out of the caves and then escape over the roof of a train. In the second level you search for a sign with information about the Holy Grail in the catacombs and then you need to climb up the castle walls of Castle Brunwald. In the third level the location is an airship. There you search for the grail diary of Indy's father, do not forget the passports. In the fourth level you need to reach the Holy Grail on time, the time is your enemy. 2D screen, partially also 3D (fourth level), the game area scrolls into all directions. Indy is a well-animated sprite. The music corresponds to the music in the movie. The levels are diversified and partially also have moving backgrounds (e. g. in the airship). Unfortunately there is no highscore list. This level shows the beginning sequence of the movie (1912). The young Indiana Jones succeeds as a pathfinder in stealing the Cross of Coronado from shady treasure hunters in a rocky cave in Utah. After a chase by foot, horse and a circus train he finally gets home. His father orders him to bring the cross back. Only as a grown-up man (after 1938) can he find it again and hand it over to a museum. In the first level, Indy needs to search a cave system for the Cross. He finds it only almost at the end of the cave. He additionaly needs torches (or else it gets dark and utterly difficult to find the way out of the caves) and whips (he can make 5 lashes with it). These items are picked up by touching them. Enemies that shoot or throw knives need to be avoided, or else they will cost him a life. If he falls too deep or he is hit by a falling stalagmite, energy will be subtracted. In the display in the lower third of the screen you see Indy's state: green number for lives, red bar for energy, number of whip lashes left and the display for the burning torch. After having found the Cross, the second part of the first level starts. Here Indy needs to walk from left to right over the roofs of the waggons of a running train. You need to avoid appearing rhino horns and heads of giraffes. Indy sets off to Venice where his father had been searching for hints to a knight's last resting-place and finds the entrance to a catacomb complex with the help of the grail diary. There he finds the crucial hint for the place of the departure for the search: Alexandretta, today named Iskenderun. Indiana learns from the members of a secret society also the whereabouts of his father; he was kidnapped to Castle Brunwald in Austria, near the border to Germany. Level two brings you deep into the catacombs. When the catacombs were built, secret arches were integrated to stop intruders. Amongst the six arches can the real searcher find the right one and continue the search. The wrong searcher will not be able to find the right arch and is condemmed to wander around aimlessly in the catacombs without ever finding the Shield of the Crusader that lies there. When you start this level, you see the arches and above each arch there is an encoded hieroglyph. These change daily, and the date is shown above the arch. To find the right arch, you need to look at the table on the back of the Byzantine Crusader, then you go to the arch that carries the corresponding code that you have found. As soon as you have found the shield you need to climb up the castle walls, but beware of the flashes. Indy frees his father from the Castle Brunwald, but his diary gets stolen. 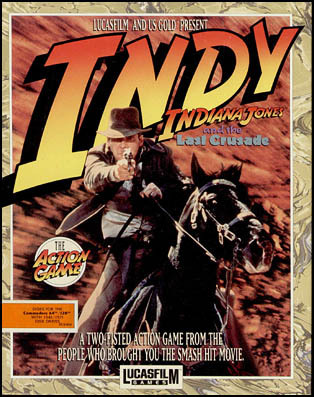 After their escape from the castle, Indy and his father go to Berlin to get hold of the book again, as it still contains some vital information. While they are leaving the town with the zeppelin LZ 138 again, they are discovered by the Nazis and flee with an airplane attached below the zeppelin. Thereupon starts a chase across the Balkans, in which the two Jones' manage only a narrow escape from the Germans. In level three the location of the game is an airship. Search for the grail diary that Indy's father has lost here. Do not forget to pick up your passports on your way. They are made of thin paper and fall apart after a short time. If Indy has no passport, an alarm sounds and your task gets correspondingly harder. The two hostile parties finally reach the temple of the Grail. But as the way to the relict is loaded with traps, they shoot at Dr. Jones and thus force Indy to personally get the grail to be able to use the healing powers of the grail for the rescue of his father. Indiana finally makes it to overcome the traps and finds the right grail from a collection of goblets and cups, after meeting with the last of the three knights who has survived the century due to the Grail's power. 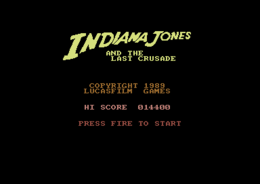 Indiana can save his father's life, but when the Grail should be removed from the temple, it collapses, the Grail falls into a crevice and is now lost forever. And finally the fourth level: Dr. Jones Sen. was wounded by a shot and his only hope is that Indy reaches the Holy Grail at the right time. The heart of Indy's father slowly turns to stone and therefore you need to lead Indy quickly but safely past the traps that the Crusaders have set up. These traps mainly consist of crevices in the ground, crossing animals and fields of letters onto which you need to hop in the right order. The time is Indy's enemy and only the bravest can make it. The right order for the letters onto which you need to hop at the end of level 4 is "Jehova", so: I, E, H, O, V, A. Choose level: press F I S H at the same time and choose the corresponding level with the number keys 1 - 5 ("Alex Fish" was one of the programmers). Next highest level: press F I S H 6 at the same time. Unlimited number of lives, if you load the game and enter POKE 32552,173, before you start the game with RUN. Or if you enter the Poke after a reset and then start the game a new with SYS 32092. Denni: "The game is very tricky and rather difficult." Sledgie: "Lucasfilm Games has realised this version as a C64 game very well. I myself could only make the screenshots with the help of the cheat mode. Already the first level needs much skill and good "joystick handling"." This page was last modified on 11 September 2016, at 16:04.